So the other day I was sitting in my living room, taking a short break from the keyboard. I think I was putting on some shoes. I don’t wear shoes if I can avoid it. For me, flip flops are a form of dressing up. I mean, a literal boom, contemporaneous with a slight shaking of the house. Having grown up in L.A., and been shaken and stirred many times, my immediate thought was that we were having a small earthquake. But what was that boom? It sounded like an over-caffeinated UPS guy trying to get me to the front door. I sat and listened and waited. No more shakes. No more booms. A quick look out the window. No UPS guy. Back to work. Half an hour later my wife comes home and says that the major street near us is completely blocked off, with cop cars and fire trucks all over the place. She asked me if I knew what happened. We walked around the corner and found yellow police tape across the intersection and a traffic cop diverting cars. We walked to the opposite side of the street and down to where all the action was. Somebody said a house had caught on fire. I went up to an LAPD officer and told him about the boom. He took my statement. Then a news van pulled up at the corner and a reporter with her camera guy comes striding toward me. “Do you know what’s going on?” she says. I told her about the boom and the shake. “Can I put you on camera?” she asked. Uh, no. I let that opportunity slip away. I merely reported the facts. 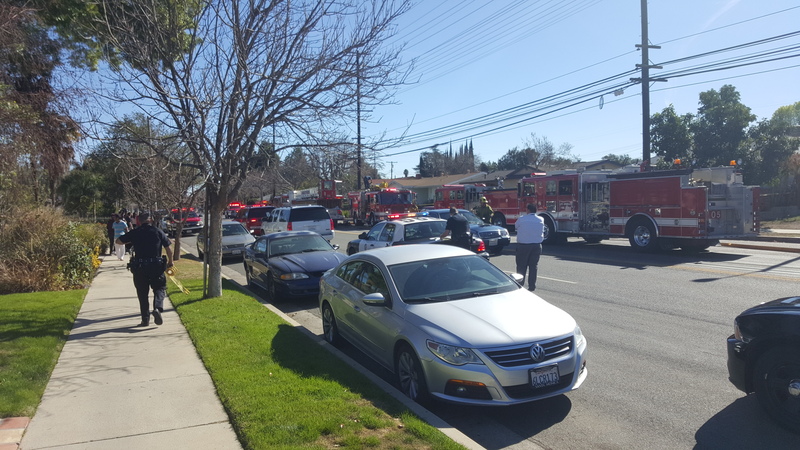 What had happened was that a detached garage blew up and caught on fire. They pulled out two charred bodies. Which had me thinking meth lab or some other illicit activity gone bad. But there were no immediate answers. Two days later Cindy and I decided to walk past the scene from the alley, where the garage door faced. There we encountered a man in boots and heavy gloves, raking the debris. 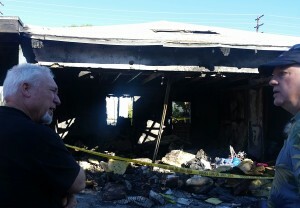 We introduced ourselves to Tom Pierce, an independent fire investigator with about forty years experience. He was most friendly, and when I subtly mentioned I was a thriller writer, he gave us a little seminar on his investigatory techniques. Turns out the victims were a mother and son, Guatemalan. She was in her seventies, he in his thirties. The arson team didn’t find enough butane or propane for a drug lab, but there was a heavy smell of gasoline. One theory is that the guy was cleaning something with gasoline and the fumes built up and someone struck a match. Whatever it was, there was instant conflagration, and the two residents didn’t have a chance. This sad scenario is obviously fodder for the thriller mind. So were the details that Mr. Pierce shared with me—burn patterns, how he breaks up the scene into quadrants, the possible sources of ignition. All now safely packed away in my mental filing cabinet. Because, for a writer, all of life is material. And it doesn’t have to be something as big as an explosion in your own neighborhood. It could be as small as a bit of snagged conversation, or the curious way one person is looking at another. Everything you encounter can lead to ideas, plots, characters, scenes, bits, beginnings, endings. Keeping your mind in an open and unlocked position is easy once you get into the habit. When you see something that lights a little fire in your imagination, add some wood to it (I can’t seem to get away from fire metaphors). The wood is What if? Let it burn. When you’re in this creative state, let yourself go. Turn off your “inner editor.” Even more, push yourself off a cliff and grow wings on your way down (a favorite recipe of the late, great Ray Bradbury). Some of your best stuff will be found on that marvelous trajectory. So what about you? How often does “real life” play into your fiction? Your creativity? My first thoughts at reading your account were drugs too. What a gruesome ending but definitely a unique opportunity to collect material for the writing arsenal. While I haven’t encountered anything like that, any time that day to day life pops ideas into my head, I usually quickly email myself so I can put it in a file for later. Related to that, I’m wondering if you or anyone else here at TKZ has ever wanted to write a book on a subject that was pressing you but you were too close to it and just couldn’t knock it loose into story form? In my line of work, I have an up close and personal view of the deplorable state of mental health care–it’s something I feel a good fiction story should come out of, but being that close to it shuts me down creatively. Anybody had that problem? Yes, because I felt like I’d be betraying someone if I wrote their part in the story. I am trying to get some distance and create a fictional character that uses, but disguises, a personal experience. Getting to speak with an investigator was great for your research. My research my involve my nephew who is a deputy with the sheriff’s police here. I LOL’d at the line: “Well, I was sitting at home working on my latest James Scott Bell bestselling thriller, when …” Hilarious! What a tragedy, but great fodder for crime fiction. I agree with you. Some of my best ideas come from studying the world around me. Jim, great story, great advice. Sad that it came out of a tragedy, but probably much of research for thrillers comes from bad situations. 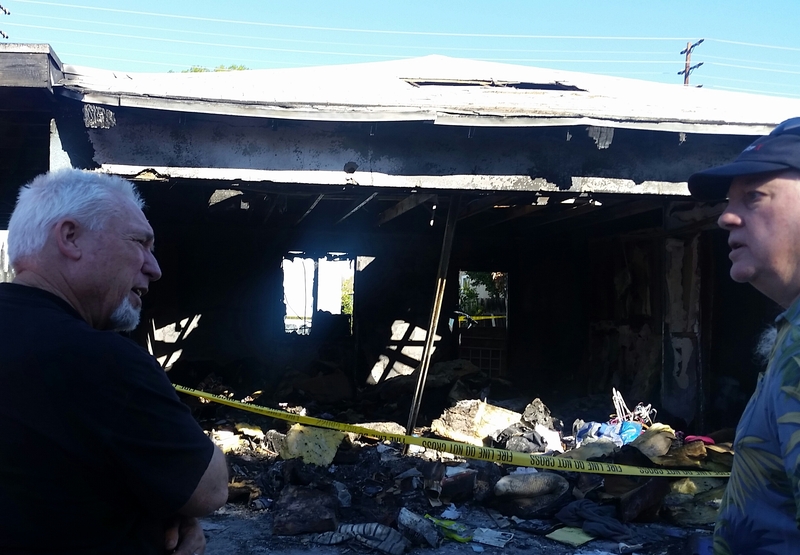 I liked your title for this post: “When the Research Comes to You.” And within that was “When the Expert Comes to You” (the fire investigator). He showed up in your neighborhood, and you gleaned valuable information. Yesterday, I was doing “scopes” at the hospital. I talk to families between procedures. When I discovered that the son of a patient was second in command of the SWAT team in a nearby city, I sat and talked to him for 30 minutes. The nurses weren’t too happy that I was getting behind, but hey…”When the research (or researcher) come to you,” make use of the opportunity. Thanks for the post. And the next time you get in front of the camera, have that elevator/news camera pitch ready. I’m convinced some of the best writing comes of “keeping your mind in an open and unlocked position.” One of the more memorable “bit[s] of snagged conversation” I’ve ever overheard was in a public garden, where a fellow was talking with his partner about a psychic “pull” he was feeling. He went on to describe a suspicious death that he believed occurred in the garden, that of a woman whose name was the same as or similar to his partner’s mother’s dear departed dog (!) and where he “felt” her body had been buried. If nothing else, it can all be very entertaining and, hey, you never know. Have notebook, will travel. Yup…never waste a chance. I’m there with you on this one. And if you conduct yourself with professionalism and tact, most people are fine with talking to you. I had this happen a couple times, most recently in a bar. Struck up a conversation with a fellow and he turned out to be a medical examiner on vacation down here. I got some good material out of that and we was very accommodating. Now I know where to find you, Kris. After BOOM I was thinking that maybe the ground opened up in your neighborhood and out came Donald Trump, followed by OJ followed by a host of TV reporters with big vans. And Basil and the boyz were there, too, and …. You said to run with it and have no fear. Now if you want to read a creepy-good true story about fire and arson, check out FIRE LOVER by Joseph Wambaugh. Naturally, it all takes place in SOCAL. Sometimes, we can’t decently take advantage of the situation. A man murdered his family and then killed himself, in the home across from us. Our entire street retreated into our homes, pulled down the shades, didn’t come out, didn’t talk to the TV reporters posted on every corner at our intersection. I just couldn’t peer into the tents or talk to the people who processed the house. I am writing a cozy mystery and had already created a “discovery of the body” scene. I used some details: the abandoned toys in the back yard (I made up something else left in the back yard); the noise of the TV-van generators through the night; the three reporters from three different TV stations taking their positions so that the cameras included the house in the background but excluded the other reporters; the officer lifting the crime-scene tape so I could back my car out of my driveway. My husband and I attended the grief counseling session held a few days later for us all at a nearby church, which did become a scene in the novel. Great blog. Funny, I received a coffee mug in the mail today. It said, “I am a writer, anything you say or do may be used in a story.” I’ve heard this many times, but twice in one day? Hmmm. Maybe someone is trying to tell me to be more aware of my surroundings. we’ve been binge watching The Wire, I wouldn’t put anything past anyone… probably a wrong headed attitude. Hard to believe gasoline is that explosive, but it must be to run a car. Glad it was far enough away from you to not be a direct problem for you.